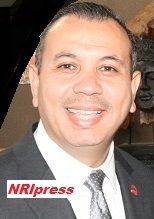 -The State Senate this week approved SB 432 by Senator Tony Mendoza (D-Artesia), Chair of the Senate Labor and Industrial Relations Committee on a unanimous bipartisan vote of 34 to 0. The bill modernizes outdated law by deleting the term "alien" from the California Labor Code, as a definition for an immigrant individual. The bill now goes to the State Assembly for consideration. "The time has come for California to remove the term "alien" from the state's Labor Code," said Senator Tony Mendoza. "Alien is now commonly considered a derogatory term for a foreign -born person and has very negative connotations. SB 432 will modernize the Labor Code and removes the term "alien" to describe a person who is not born in or a fully naturalized citizen of the United States." "The word "alien," and any law prescribing an order for the issuance of employment to "aliens", have no place in the laws of our state and more importantly, should never be the basis of an employment hiring. SB 432 will delete this outdated, discriminatory and unnecessary reference in state law," said Senator Mendoza. The United States is a country of immigrants who not only form an integral part of our culture and society, but are also critical contributors to our economic success. Immigrants work and pay taxes, create new products, businesses, and technologies and generate jobs for all Americans. In 2013, according to the Bureau of Labor Statistics (BLS), there were 25.3 million foreign-born persons in the U.S. labor force, comprising 16.3 percent of the total (Bureau of Labor Statistics, "Foreign-Born Workers: Labor Force Characteristics in 2013"). The BLS also found that foreign-born workers were more likely than native-born workers to be employed in service occupations. Furthermore, the U.S. Department of Treasury notes that immigrants own 10.8 percent of all firms with employees, providing job opportunities for thousands of Americans. "California is among the top destination states for immigrants in the U.S. Given the abundant evidence of their many contributions, it is imperative that any derogative references to foreign-born individuals be repealed from state law," added Senator Mendoza. In 1937, the Legislature enacted various provisions regarding the employment of "aliens", who are defined as any person who is not a born or fully naturalized citizen of the United States, and a provision which prescribes an order for the issuance of employment under specified public works contracts - first to citizens of the United States, second to citizens of other States in the United States, and third to aliens. The Legislature repealed most of these Labor Code sections in 1970. Unfortunately, the definition for "alien" and the order under which employment is to be given to "aliens" was not repealed and are still found in the Labor Code. SB 432 will delete the term "alien" as a definition for an immigrant individual and the outdated requirement the law that prescribes an order for the issuance of employment under public works contracts to citizens and aliens. Under current law, all employment protections, rights, and remedies available under state law, except as prohibited by federal law, are available to all individuals regardless of immigration status. (Labor Code §1171.5) Over the last few years, several bills have been passed and signed into law which has strengthened labor law protections for immigrant worker. According to a study conducted by the Pew Research Center, the use of "illegal alien," a term considered insensitive by many, reached its low point in 2013, dropping to 5% of terms used. It had consistently been in double digits in the other periods studied, peaking at 21% in 2007. Senator Tony Mendoza, a Los Angeles native and former elementary school teacher in East Los Angeles, represents the 32nd Senate District encompassing portions of Los Angeles and Orange Counties.